Robert Lee Evans, 70, passed away Tuesday, April 9, 2019 at Newman Regional Health in Emporia. He was born on December 25, 1948 in Chanute, Kansas the son of Roy Lee and Ona Marie Norris Evans. Bob attended Madison High School and graduated with the Class of 1967. In February of 1969 Bob was drafted into the United States Army and he began his training at Ft. Leonard Wood, Missouri. Bob served in Vietnam as a radar technician until receiving an honorable discharge in 1970. He would reenlist in November of 1982. His military service took Bob throughout the world serving in Hawaii, Germany, Operation Desert Storm and Korea. During Operation Desert Storm Bob served as a forward observer for the MLRS Artillery System and would later teach the system’s operation to new recruits. 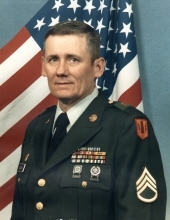 Bob retired as a Staff Sergeant on January 31, 2000. He was joined in marriage to Connie Jo Hoobler Haas on July 5, 1991 in Emporia, Kansas. Following his retirement Bob and Connie would make their home in Madison where he took a position with the City. After seven years with the City of Madison he began working as a welder’s assistant on Pipelines in Texas and Mississippi for three and a half years. He also worked for Justin Sage Backhoe Service for two years. Bob was an avid sports fan. He coached youth baseball in Madison and served as an umpire for many years. He was a member of the United Methodist Church of Madison; American Legion Post #124 of Madison and the American Legion Post #1980 in Emporia. He will live on in the hearts of his wife, Connie of their home in Madison; daughters, Denise (Scott) Anders of Holly Ridge, North Carolina, Teresa Adams of Blackwell, Oklahoma, and Amanda Cooper (Billy) of Madison; a son, Kane (Jolene) Haas of Madison; brothers, Don Evans of Scottsdale, Arizona, Ron (Patty) Evans of Fowler, California and Tom Evans of Clayton, North Carolina; grandchildren, Rachel, Zach, Quentin, Trey, Evan and Aubrey; great-grandchildren, Mason, Kaston, Anabella, Emma and Isaac, numerous extended family and dear friends. He was preceded in death by an infant sister; his parents, Roy Evans and Ona Marie Norris Evans McIlvain and his step father, Glenn McIlvain. Services will be held at 10:30 A.M., Saturday, April 13, 2019 at the United Methodist Church of Madison. Burial will follow services at Blakely Cemetery. Memorial contributions may be made to the American Legion Post #124 (All Veterans Memorial) and sent in care of the VanArsdale Funeral Home at P.O. Box #488, Madison, Kansas 66860. Condolences may be expressed at vanarsdalefs.com. To send flowers or a remembrance gift to the family of Robert Lee Evans, please visit our Tribute Store. "Email Address" would like to share the life celebration of Robert Lee Evans. Click on the "link" to go to share a favorite memory or leave a condolence message for the family.